Go Shuck An Oyster: Book Signing: Shucked. If you live in the Northeast, you had a few good options to get your fill of oysters today. 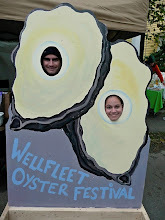 Our staff split up with Adam covering the great Wellfleet Oyster Fest in Wellfleet, MA and some of us went to the Barnes & Noble in Hingham, MA to hear Erin Byers Murray as she read from her new book, "Shucked: Life on a New England Oyster Farm". Having just received the book last night, I am only on chapter 3, so I'll have my complete review sometime next week. For now, I can tell you that it has alreadly exceeded my expectations as it has my mind wandering toward the water picturing Erin and her crew culling (sorting) oysters. Having visited and toured many oyster farms, I was very familiar with this sorting process but I had missed an important point that perhaps separates the good farmers from the best farmers. During the sorting process, Erin let us know that she wasn't just sorting by size but also looking for cracks in the shell, hollow shells that signify dead oysters, and even thinking about how the oyster would sit on a plate at the restaurant it would ultimately be delivered to. I'm really looking forward to finding the time to finish this book. After the book reading and speaking with Erin for a few minutes, more than half of the crowd walked a few steps over to Jasper White's Summer Shack for oysters and to discuss the book. It had been a while since I had been to one of Jasper's restaurants; what a mistake, as I really enjoyed everything I ate. All of us enjoyed the mussels cooked in fra diavlo sauce. We used every inch of our bread to soak up as much of the sauce as we could. The peel and eat shrimp, cooked in a mesh bag that had been steamed to perfection with old bay, celery and onions, were very tasty and fun to eat. The selection of oysters was impressive but the prices tend to be on the higher side. We ate Onset oysters today that come from Buzzards Bay. They were plump, salty, and had hints of seaweed taste. "Very yummy," as wife says. Erin has several book signings and events coming up. I suggest attending one and getting your copy of her booked signed. This young author's signature will probably be worth a lot someday, especially if that signature is on her first book. For a list of upcoming book signings and events, visit Erin's blog by clicking here. The book is a great buy for those who know nothing about oysters, to the oyster aficionado, and especially for anyone who ever thought about leaving a job to experience something different or something more satisfying.